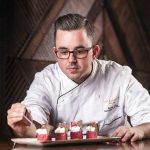 The Langham, Hong Kong welcomes the talented Spanish chef David Puig Zaragoza as the new Executive Pastry Chef. The new chef is determined to surprise the guests at Bostonian Seafood & Grill with an artistic sweet collection during the city’s Arts Month. With the new appointment, David oversees the pastry division across all western restaurants, as well as in-room dining and the catering operation for the five-star hotel. “While I am very excited to lead the creative and energetic team at The Langham, Hong Kong, I am especially amazed by the fact that art is all around the hotel on my arrival. With the Arts Month approaching, this is a perfect timing to connect my new creations with the diversfied art treasures in this space.” said David. The young chef from Barcelona is translating the remarkable hotel artworks by Chinese and American contemporary artists into five art-inspired desserts. The True & False Banoffee Pie, referencing to the interesting title of art piece True & False Monkey King by Chi Peng at Artesian, is composed of pecan nut sponge cake, light banana and Valrhona Dulcey chocolate mousse, vanilla caramel sauce and dulce de leche ice cream. David raises a philosophical question to the diners with the delicate presentation of the dessert – is it true when it looks like real? The definition of true and false awaits to be answered. The Butterfly Matcha Crème Brûlée is designed with a chocolate butterfly wing elegantly at rest on the Uji matcha green tea crème brûlée, yuzu, cocoa sable and yogurt, resembling to the key feature of the steel sculpture, San San Can Fly by Liao Yibai in the hotel lobby. Recreating the orange colour and texture of the oil on canvas Banquet by Ran Jue at T’ang Court, The Citrus Garden is a mandarin sorbet with citrus shots, Valrhona Ivoire Chocolate and basil cream. The array of citrus fruits delight the palate and brings a refreshing end to a meal under the warm weather of Spring. The Chocolate Pentacle Temptation with Valrhona Bahibe chocolate mousse, cream and ganache, praline financier and exotic sorbet, echoes the brown tone and the star shape of Leng Jun’s art piece Pentacle at Palm Court, with the use of chocolate and cocoa powder. Red is the color of passion and happiness. The Red Strawberry Paris Brest is inspired by two red art pieces, namely the Seaform by Dale Chihuly at the hotel reception and Decayed Landscape No. 1 by Zhang Xiao Tao in T’ang Court. 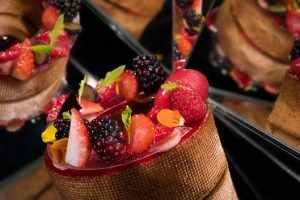 David transforms the color and texture from the artworks into a choux pastry filled with mascarpone and strawberry cream, topped with forest berries, balsamic and raspberry sorbet. The art-inspired desserts are priced from HK$118 to HK$148, subject to a 10% service charge. They are available at Bostonian Seafood & Grill for a month from 22 March to 22 April 2018.